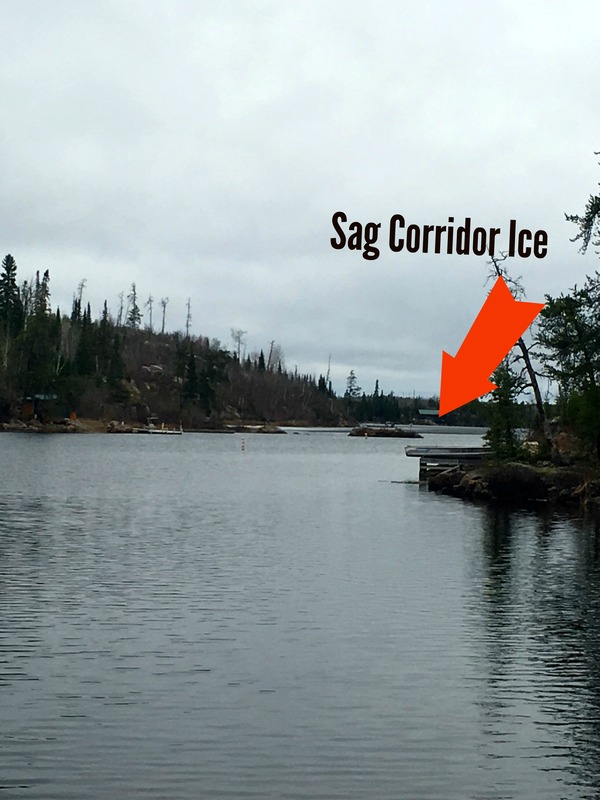 Boundary Waters Trip Tips and "How To"
If you’d asked us six weeks ago, we’d have told you it looked like an early ice out year for sure, but here it is, April 21, and we’re still iced in on the Gunflint Trail. Despite warm weather and open water in the rest of the state, it’s not paddling season quite yet. But soon . . . very soon . 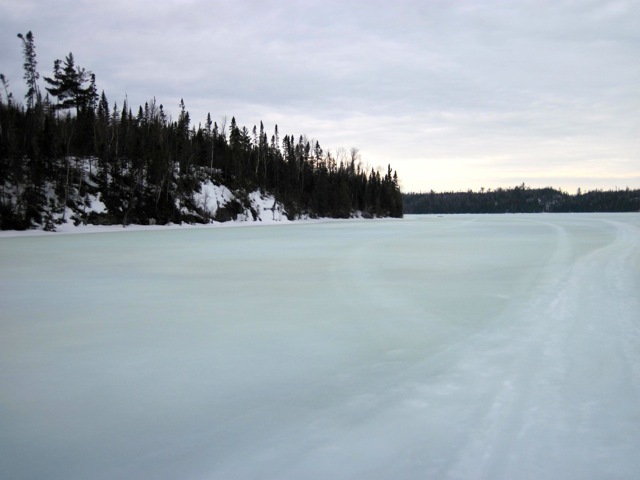 . .
Local lore is that Gunflint Lake’s ice goes out two weeks after the North Brule River’s ice goes out. 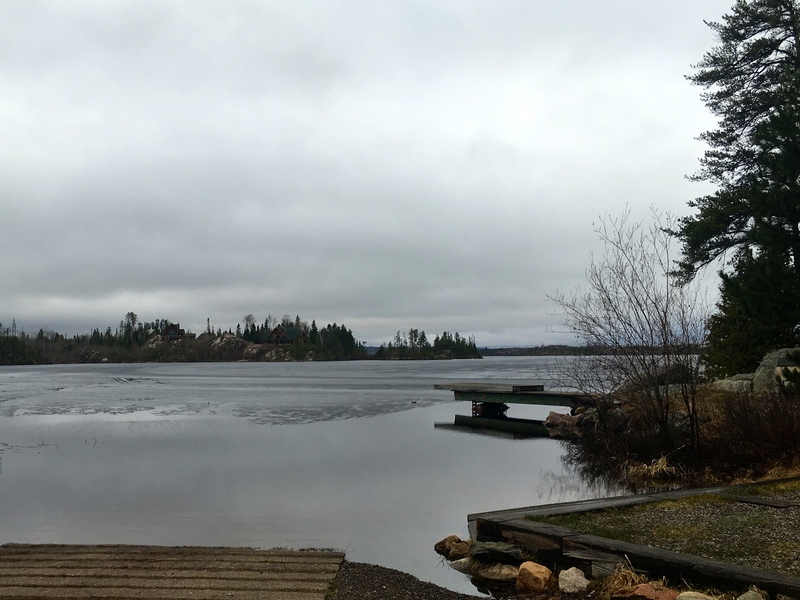 North Brule was ice free on April 15, which makes April 29 the day Gunflint should go out this year. That said, it looks like the western part of the lake may be ice free before that. You just might be able to paddle into the Boundary Water’s Larch Lake via Larch Creek. Of course, you might find yourself facing a big iceberg when you reach the lake. 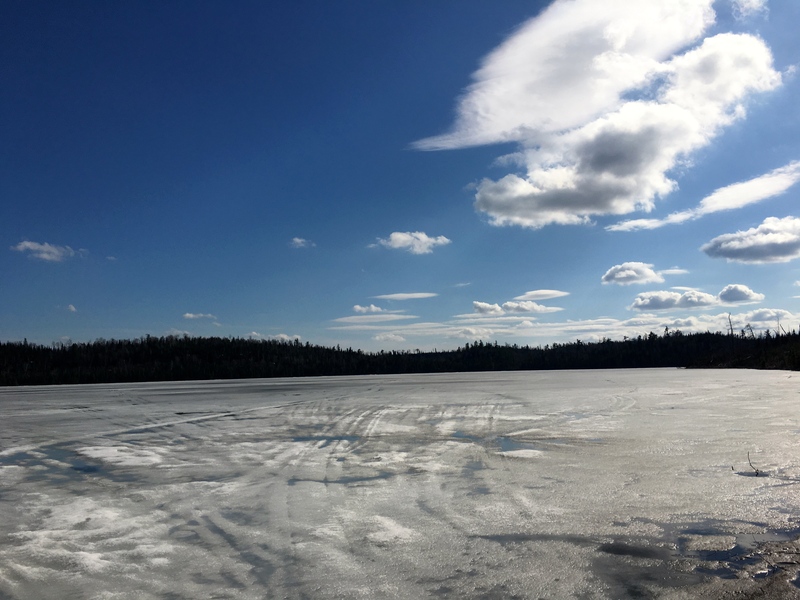 Both Seagull and Saganaga Lakes have pulled away from their shores significantly, but a lot of melting that needs to happen before they’re ice free. Meanwhile, Cross Bay is looking pretty liquid and you could probably make it to the first campsite on Ham Lake. The high water washed away the beaver dam that was built last fall. The river’s really churning away right now. It’s a pretty incredible sight. Until we’re ice free, we’re going to party like it’s 1999 . . . . 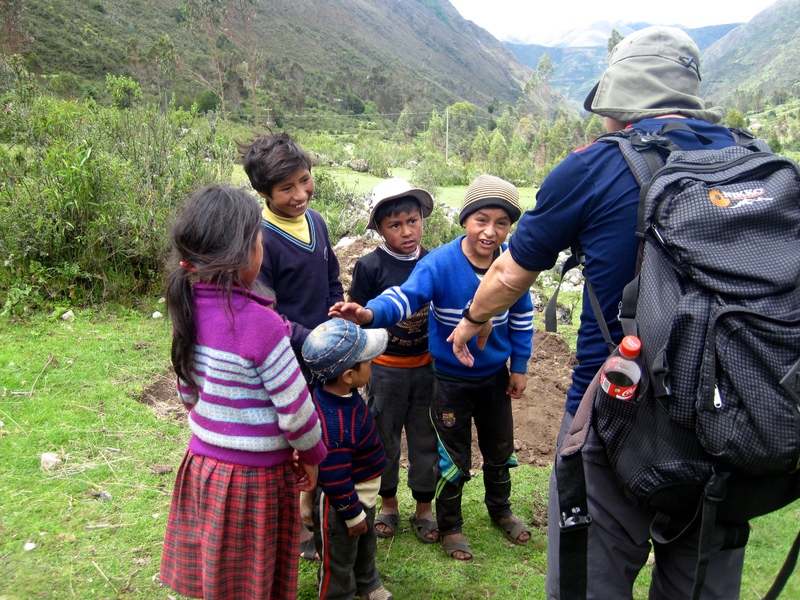 I recently returned from Peru, which, among other things, included a three day, two night backpacking trek through the Andes. With a weight limit for our personal items, we had to think strategically about our packing and weigh the importance of each item I packed. What I learned during the packing process is applicable to any camping trip and might help you pack your personal items for a canoe trip in Superior/Quetico country. Dress like an onion: The saying, “If you don’t like the weather, wait 10 minutes, it’ll change,” rings as true in the rural areas of Peru as it does in the Boundary Waters Canoe Area Wilderness. In both places, it’s not unheard of to experience all four seasons in a 24 hour (or less!) period of time, so dressing in layers is key. Because I was only on trail for 3 days, I packed just one outfit to see me through all weather: lightweight nylon pants (not zip-off, but ideally they should have been), tank top, long sleeve tech shirt, wool turtleneck sweater, Primaloft packable vest. I also packed a pair of wool long underwear to use as pajamas or as an extra layer if it got really cold. We hiked mostly in 50+ degree weather, so I only wore the tank top and long sleeve shirt, but I sure wanted the sweater and vest in camp at night when temps dipped into the low 30s. At the end of the hike, the clothing remained fresh enough that I could have worn it for a couple more days. Wool is king: Cotton just isn’t the fabric of our camping lives. Although wool gets a bad rap as bulky and itchy, recent advances in merino wool/nylon blends have created a plethora of lightweight socks (some “smarter” than others) and undergarments perfect for camping. Wool wicks moisture, is breathable and warm, and feels clean for much longer than cotton. Personally, I’d rather spend more and enjoy dry feet all day, rather than having my feet rotting away in a pair of cheap cotton socks. Other things you won’t be sad you spent a little more on: rain gear, hiking boots, a sunhat with a chin strap, and a reliable and easy to use headlamp. Repack your pills: When you’re out in the woods, you want to nip any medical issues in the bud, so I basically lugged around an entire pharmacy: ibuprofen, Pepto-Bismol, Diamox (high altitude/motion sickness pills), Benadryl, Immodium, Gas-X, Ny-Quil, etc. etc. Our physician told us to keep the medications in their original bottles for the plane trips, but before the hike, I should have spent two minutes repacking six of each pill (or the daily maximum of pills x the number of days on the trail) into a small pill organizer case. I appreciated having all of the medications along; I just didn’t full bottles rattling around my backpack, since you only need one or two of each pill during your trip, if you need them at all. Children from the nearby farms we hiked beside. Be comfortable: I like to pack light, but within reason. To me, it was worth the extra weight to throw in a couple items to make evenings in camp a little cozier. I knew I wanted to change out of my hiking boots and I wanted to slip into something warmer than a pair of lightweight flip-flops, especially with night temps close to freezing. I settled on wool clogs with rubber soles which felt warm, sturdy, and secure as I navigated the campsite after dark. On a similar note, throw in a small towel or washcloth and heat up a little extra water when you’re starting dinner so you can do a quick sponge bath each evening. You need far less “goop” than you think you do: I needed far less personal hygiene items than I predicted. My mom gave me a 1 oz. tube of 70 SPF sunscreen for the trip, which seemed pretty darn pithy. Yet, despite frequent liberal sunscreen applications, at the end of the trip, I’d only used half the tube. I packed 4 oz of Purell, but used about an ounce. While it’s better safe than sorry, you probably need less than half of what you think necessary. One thing that worked out perfectly were the OFF! Deep Woods Insect Repellent wipes. We didn’t visit at a buggy time of year and wore long sleeves almost exclusively, so having these towelettes available was way better than lugging along a big spray can of basically untouched bug spray, even though the towelettes meant a little more trash to pack out. 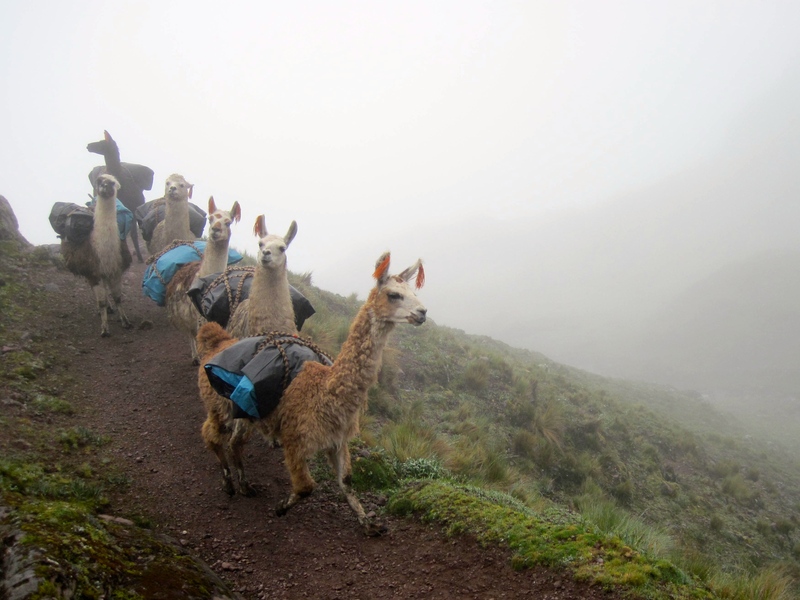 A crew of llamas relieved us of most “portaging” duties. Update: We’ve developed this Boundary Waters personal gear packing list based on the packing list I used for Peru. 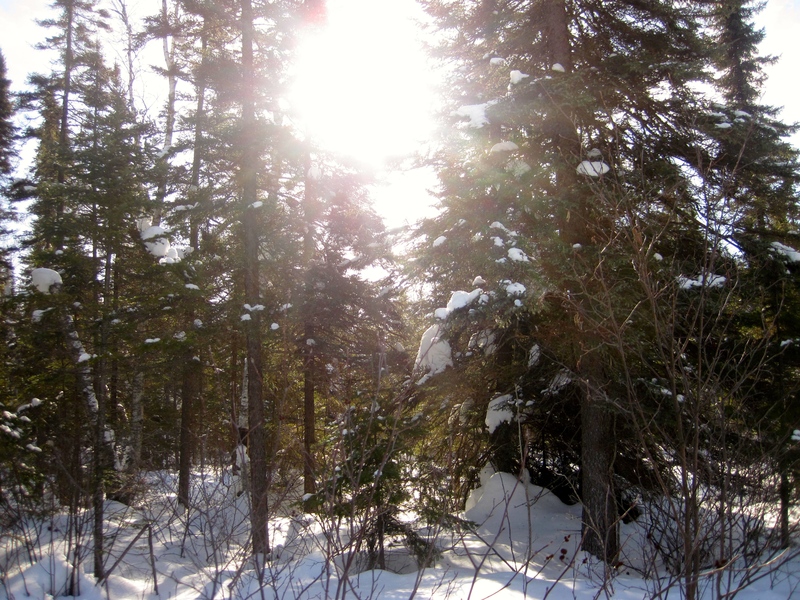 What’s Winter Doing on the Gunflint Trail? 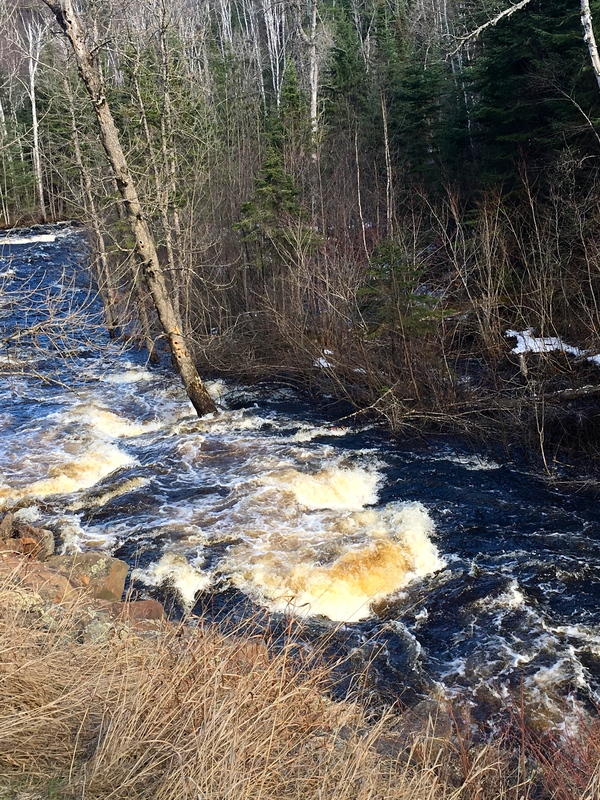 The Gunflint Trail hasn’t been exempt from the unseasonably warm weather that’s swept across the Midwest the past couple weeks. 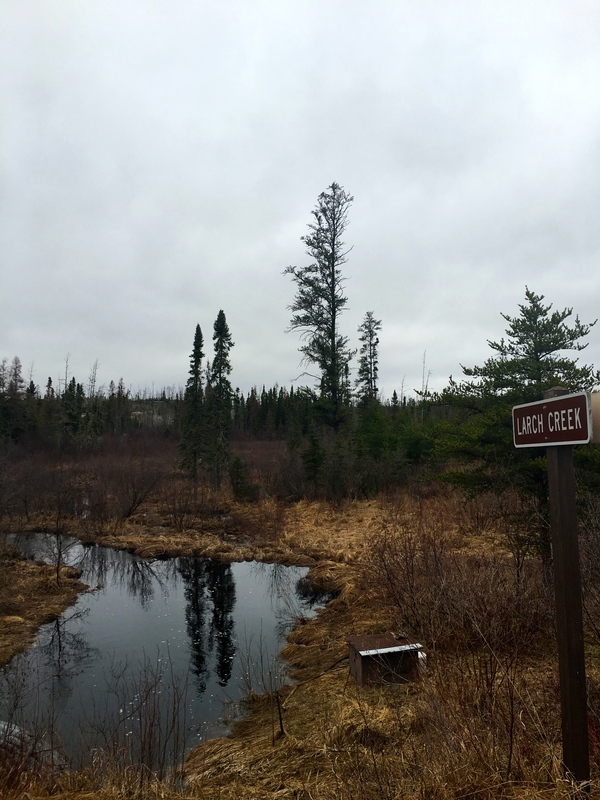 This weekend, temperatures soared to the 50s on the upper Gunflint Trail and that leaves us in a strange limbo season: not quite winter, but definitely not quite spring either. Until we hear winter’s final death knell, we’re planning to wring as much winter recreation as we can out of this fleeting season. We’ll just be wearing sunscreen and sunglasses a little more often than we’ve been in the last couple months. 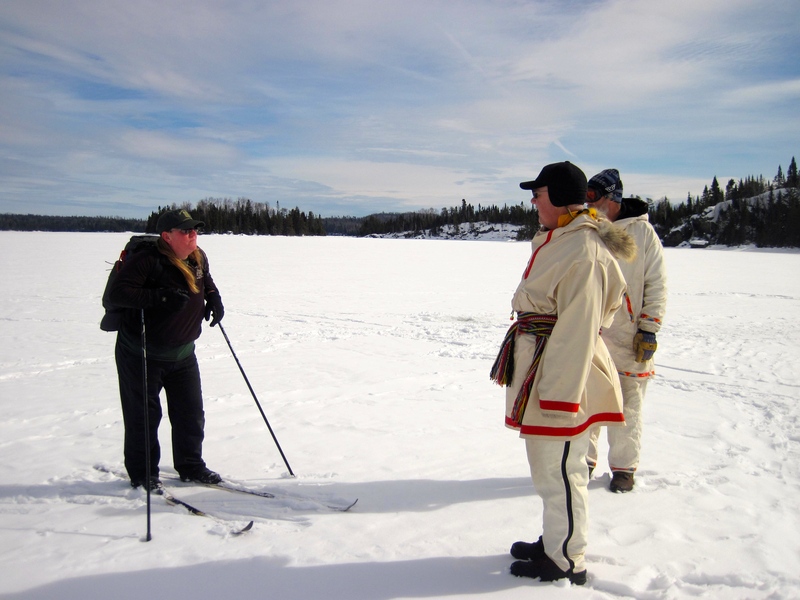 Winter campers are still heading out into the Boundary Waters. One group this past weekend landed 17 lake trout on Tuscarora Lake and also caught a brook trout as they passed through Missing Link Lake. 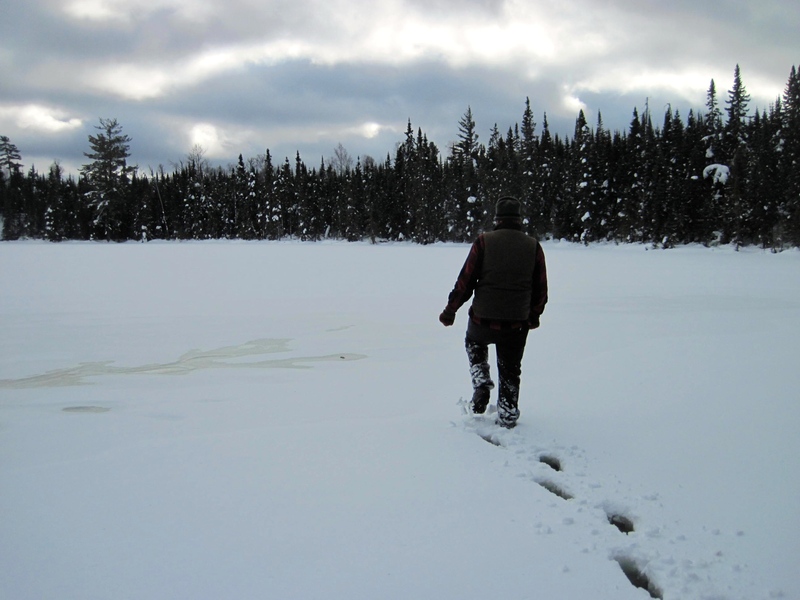 We fished Seagull Lake on Friday and while we weren’t quite as successful as the Tuscarora group, we did manage to get a couple lake trout on the ice. The snow layer has melted off the lakes’ surfaces, which makes travel across the lakes very easy. 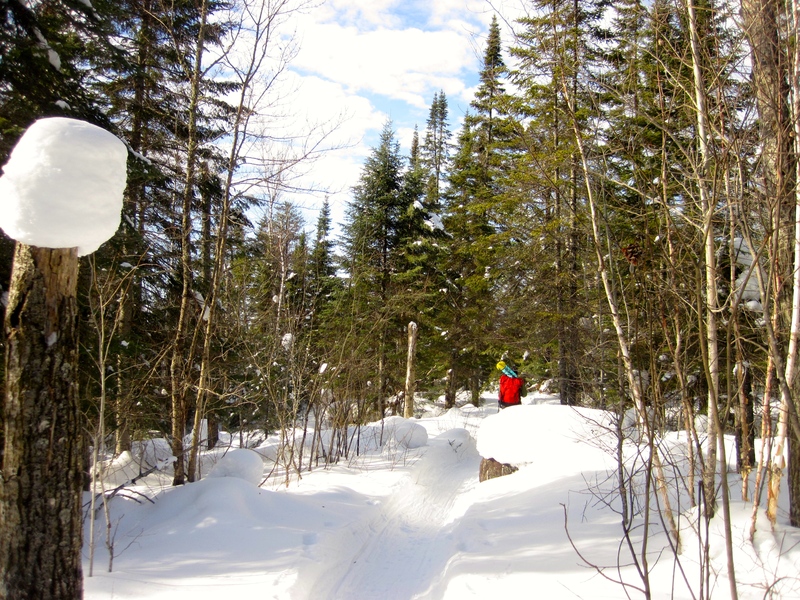 It’s nice not to hassle with snowshoes, although you’ll want those if you’re traveling through the woods since the snow is a little punchy off of packed trails. 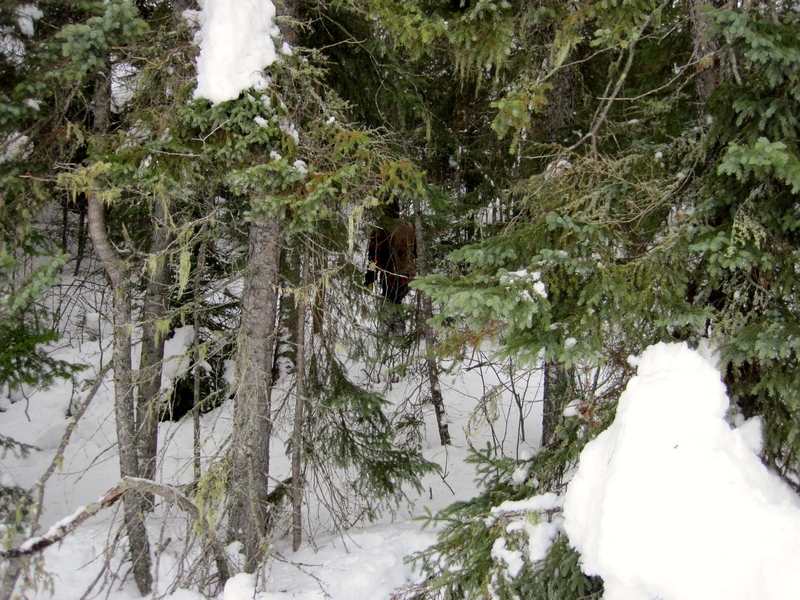 (If you’re a cross country skier, Bearskin Lodge is reporting “surprisingly good” ski conditions.) 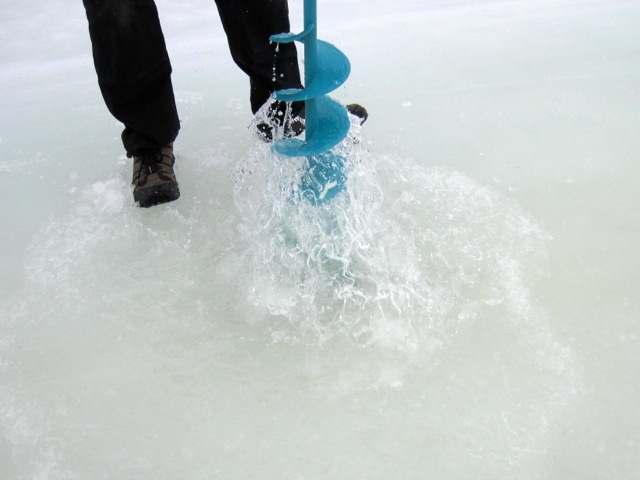 We’re planning to take advantage of the smooth sailing this week to get some ice fishing in on the western end of Seagull Lake. A couple evening cookouts on Missing Link are on the docket too. 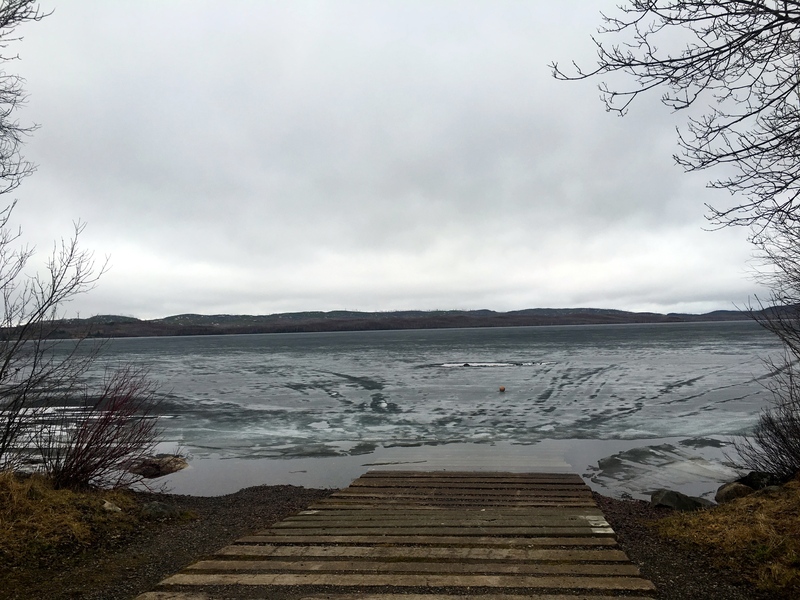 No doubt it will be an earlier ice out than we’ve had the last couple springs, but we believe the lakes will be safe to traverse at least until lake trout season closes on March 31st. The cool down (and grey skies) predicted for this week should help maintain the ice, so barring a string of 70 degree days, we will not be beating 2012’s record ice out dates this year. 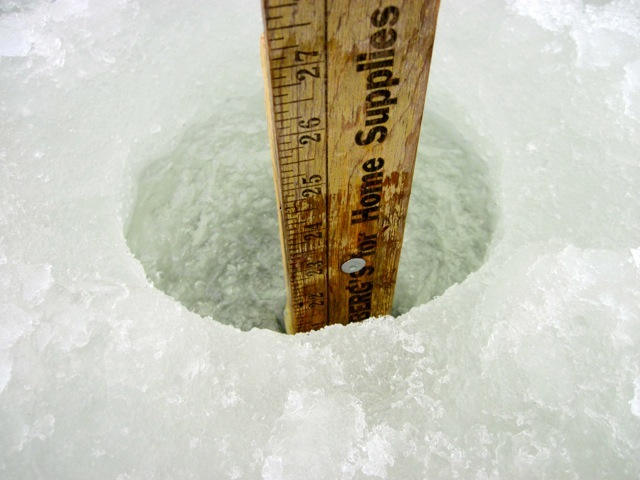 We drilled a hole in Round Lake yesterday (Sunday, March 13) and found 21 inches of ice. There’s about 4 inches of slush on top, with about 17 inches of ice underneath. 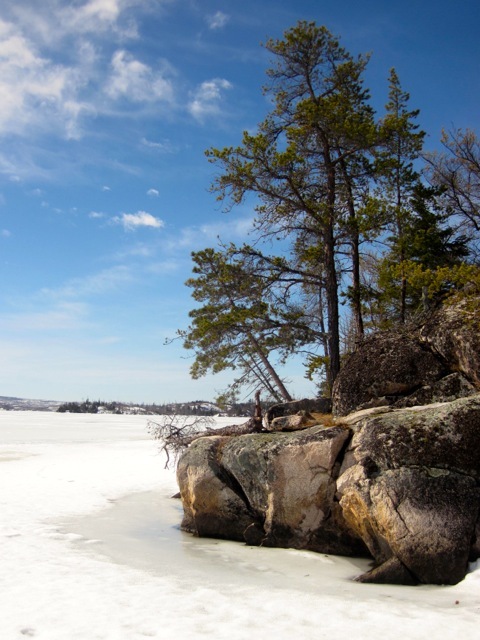 Until the ice is off the lakes, we wish you Bon Hiver! A couple years ago, somewhat inadvertently, I wrote a series of articles about Minnesota maple syrup producers. 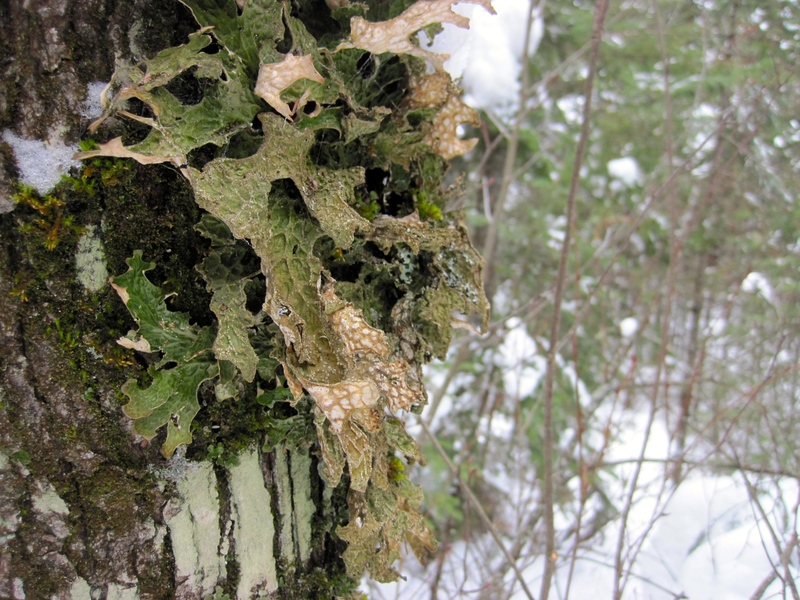 I’m no maple syrup expert, but I do always remember that when temperatures climb above freezing in the day and then fall back below freezing at night, that’s when maple sap starts flowing through the tree trunks and maple syrup producers start firing up their big evaporators. Now each spring when the sun shines high and bright in the sky and snow starts drip, drip, dripping off the pine branches and packed trails grow slick and smooth, I crave waffles. I’ve come to think of these days as “maple sugar” days, especially since this is when the hot sun melts the snow into a texture similar to granulated sugar. We’re not quite at the 2016 maple sap run just yet (it’s currently -3ºF), but like the rest of the state, we had quite the “maple sugar” day on Saturday. I took one look out the window on Saturday morning at the brilliant blue sky and decided two things: 1) I was done taking a Vitamin D supplement until November and 2) It was a good day for adventure. We jumped on the bandwagon and headed into Tuscarora Lake. Starting on Wednesday, we watched group after group head across Round Lake for the Missing Link portage. By the time Saturday morning rolled around, there were about 10 groups camping or fishing on Tuscarora. I guess we’re all pretty good at reading weather forecasts. 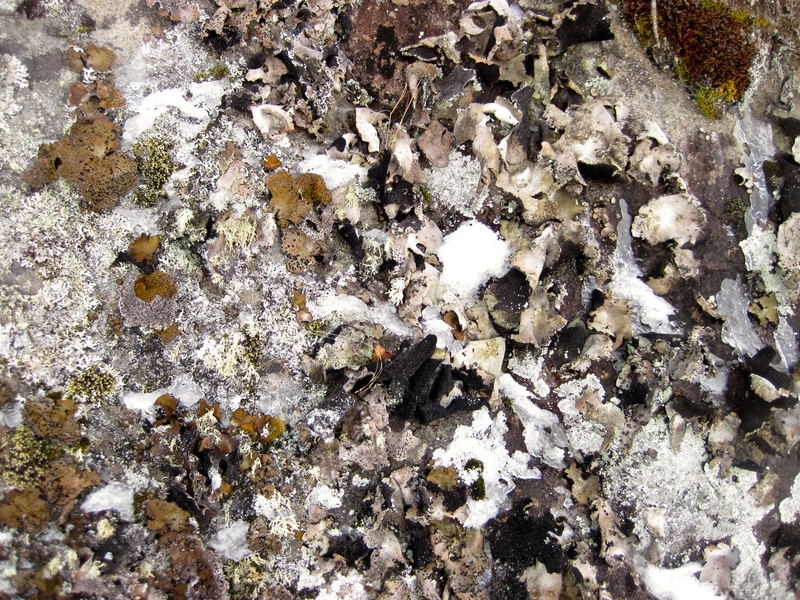 All the tree stumps were wearing “snow hats” on the hike in on the 426 rod Tuscarora portage. By the time we came back, most of this snow had slipped off. We were hoping to meet up with a couple friends camping on the west end of Tuscarora among the islands. 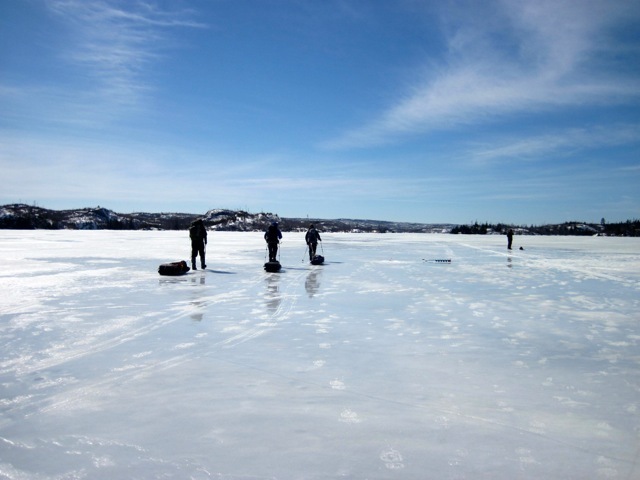 We couldn’t spot them at first, so we started ice fishing on the edge of the north bay. I got a bite and lost my minnow, but that was it for action, so we packed up and set off to search for Mark and Dave again. We finally spotted them along the south shoreline east of the Owl Portage. They really blended into their surroundings with their white anoraks on! Because it was so busy on Tuscarora Lake, U.S. Forest Service wilderness rangers were out making contact with winter campers. They want to make sure that campers are filling out permits and also talk about responsible firewood gathering and fire making during the winter. We really appreciate all the work these folks do so the wilderness can be enjoyed by everyone. Although Dave and Andy’s fish finders showed a pretty impressive underwater drop off, fishing was remarkably slow. Apparently the fish were as confused by what was going on with the barometer and thermometer as we were. Even if the fish were feeling shy, it sure was a pretty spot to hang out for an hour or so. 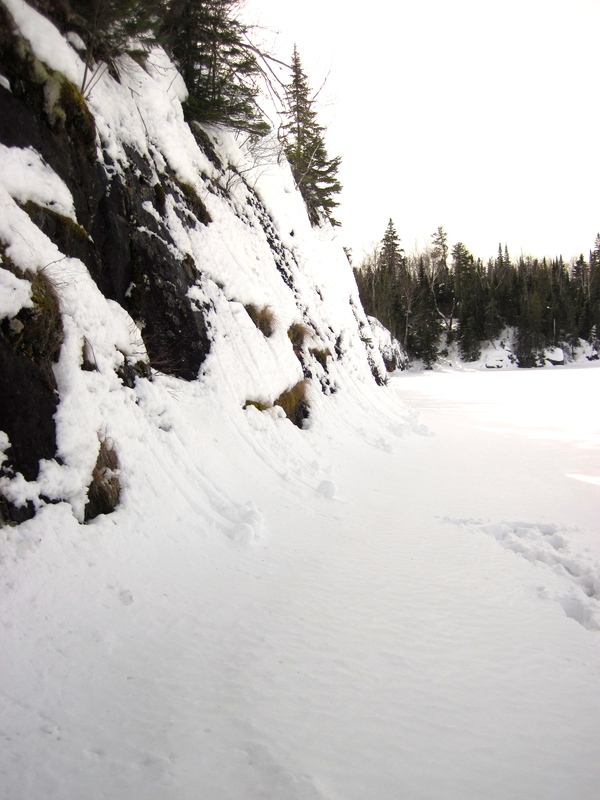 The cliffs behind us was busy making snowballs by itself as the sunshine melted snow at the top of the cliff which then rolled down the side of the cliffs to the lake ice. By the time we hiked out, the temperature was 42 degrees in the shade. Our sunburned faces attest that we got more than our fair share of Vitamin D. The perfect maple sugar day! Lately, Andy and I have been searching for Mavis. No, not that Mavis; Mavis Lake, located a half mile south of Round Lake and just east of Missing Link Lake. 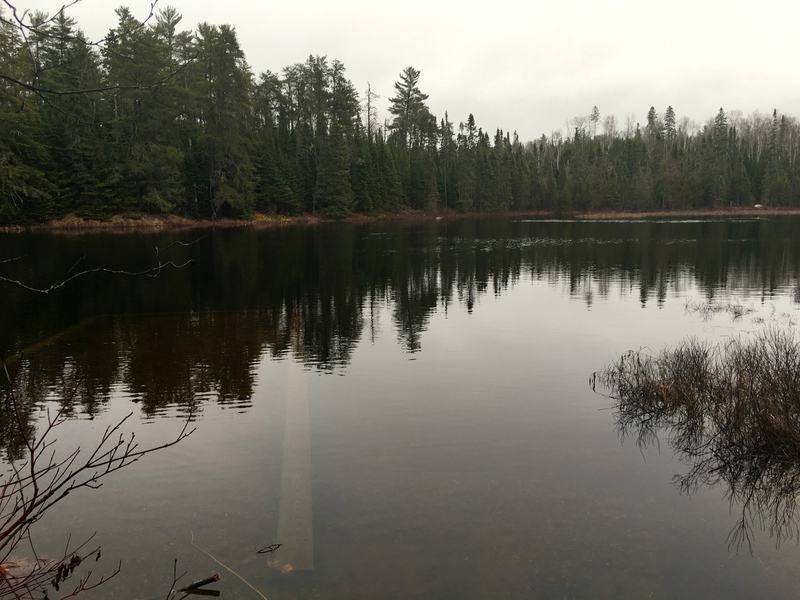 It’s a little puddle of a Boundary Waters lake that the DNR keeps stocked with brook trout. 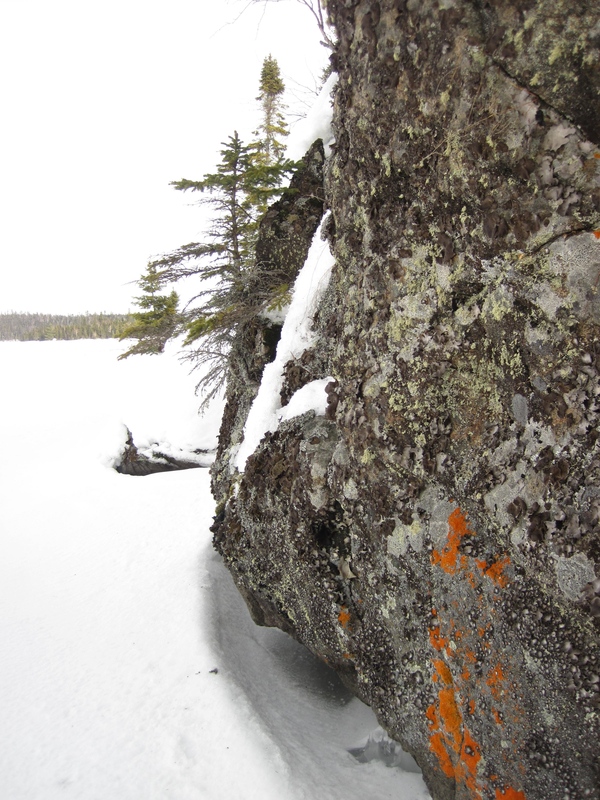 You can access Mavis from the easternmost point of Missing Link Lake via a 40 rod portage. But what if there was a way to get into Mavis directly from Round, allowing you to bypass Missing Link altogether? 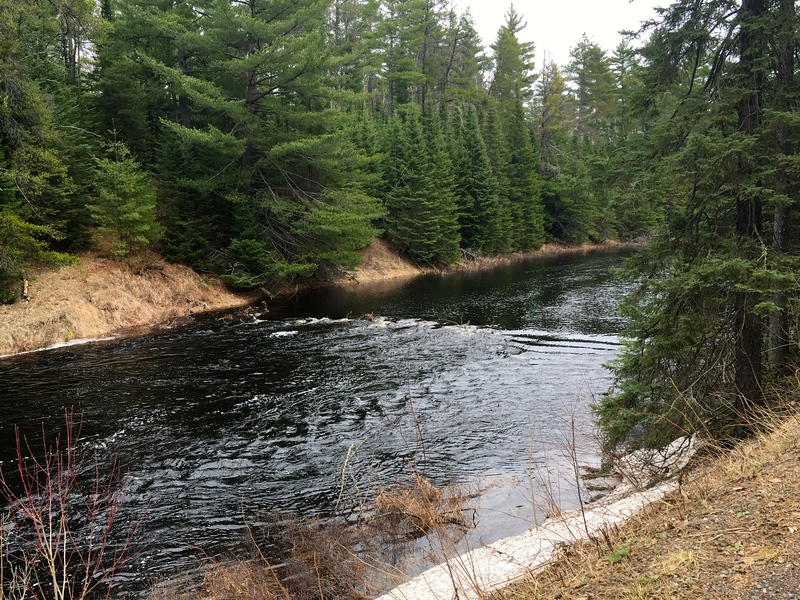 According to local old timers, back in the Leeds’ family time at Tuscarora, there used to be a portage from Round to Mavis that took off not far from the Round to Missing Link portage and cut southeast along a flowage. In fact, this portage was the preferable route into Mavis since the Missing Link to Mavis portage features a pretty steep uphill climb. The trail’s not just a figment of locals’ imaginations. 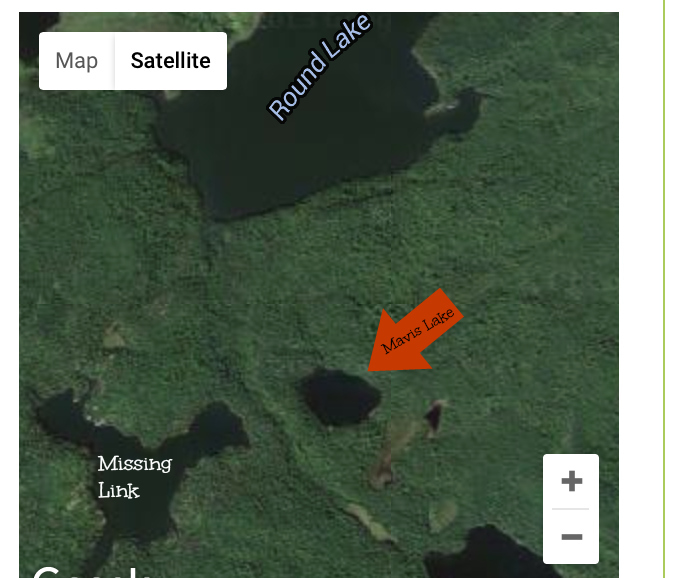 If you go onto the DNR’s LakeFinder website and look at Mavis’s fish survey, the DNR indicates that as of Autumn 2003, there was indeed a portage trail from Round Lake to Mavis. There’s just one little problem. While 2003 isn’t exactly ancient history, it doesn’t take very long for BWCAW forest to reestablish itself and reclaim a portage path. 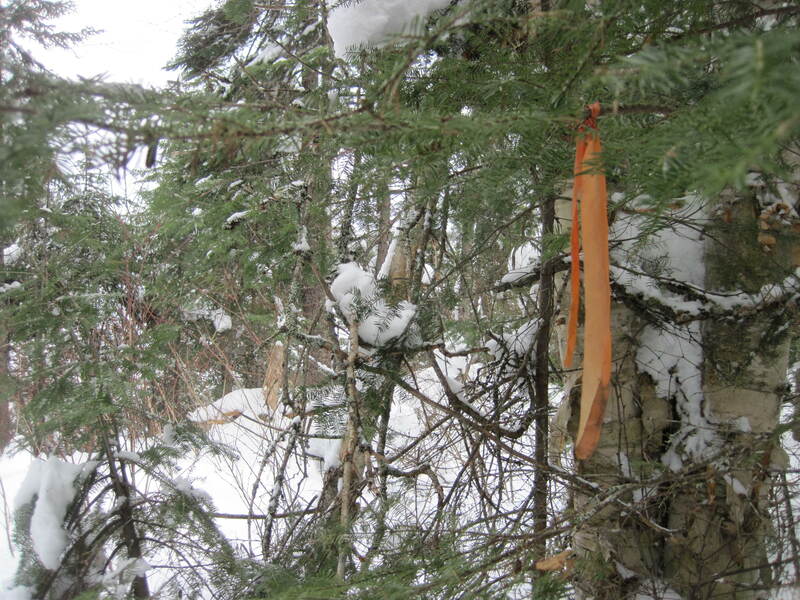 Anyone who’s tried to bushwhack through Minnesota woods known it’s a very slow process mostly spent untangling yourself from balsam and aspen saplings. If the trail really hadn’t been used for over a decade, we also knew some of those saplings were going to be decent sized trees by now and portage’s path wasn’t going to be too obvious. But even if the chances of success were low, we couldn’t not look for this neglected path. “Because it’s there,” as George Mallory would say. We set out a couple weeks back, choosing to cut up the Round Lake shoreline just below the cliffs near the Missing Link portage. We waded through snow, clambered up cliffs (and occasionally slide down cliffs), had amble amounts of snow fall down our necks and while I was sure we just had to make it over the hillside to reach (or at least see) Mavis, Andy’s GPS told a different story. After a half hour crashing through brush, we’d only made it about 2/10ths of a mile away from Round Lake. We ceded defeat and turned around. At least we enjoyed some great views on a beautiful bluebird day. But we weren’t going give up just yet. Thanks to some information that came in from a Leeds’ family member, we were able to pinpoint the starting point for the elusive Round to Mavis portage. Last Sunday afternoon, we set out again, slightly more hopeful that we’d clamp eyes on Mavis this go-round. We found the starting point easily enough along the shoreline and we wound our way through the young forest, trying to determine if we were going through growth that wasn’t older than 12 years. Undeterred, we pressed on. 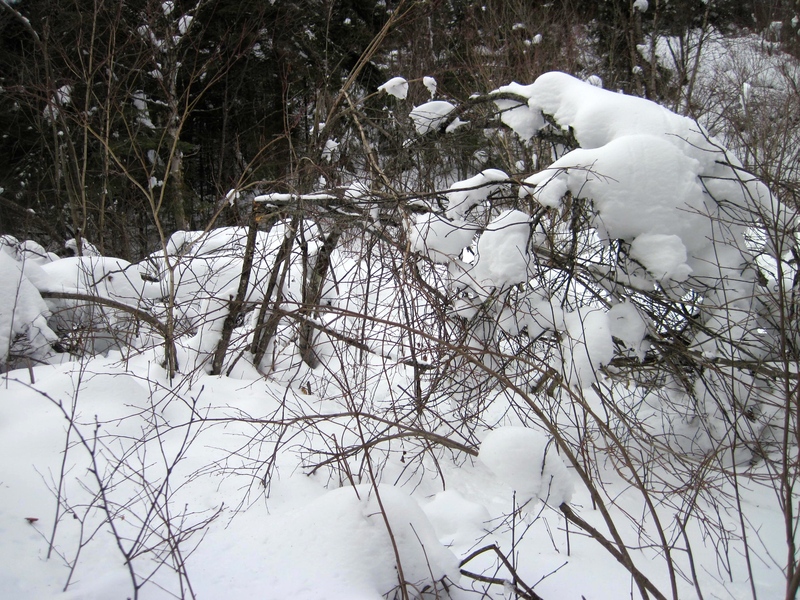 . . through waist deep snow that pushed up our pant legs and through low hanging balsam branches that tried to steal our hats. It was pretty clear we weren’t on the right path, but by the time we acknowledged that, we were closer to Mavis than to Round and it made more sense to just keep moving forward, albeit at a snail’s pace through the thick forest. We weren’t about to turn around and head back the way we’d just came, so we found the portage to Missing Link and looped back to Round Lake. Oh the joy: flagging! Mavis to Missing Link portage. 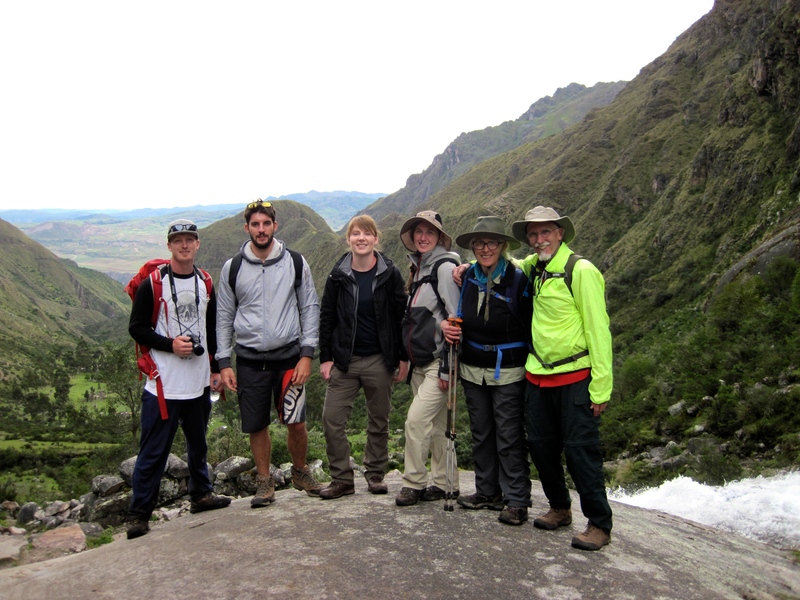 By the time we were back at our starting point, it was about two hours later and we’d gone a whole . . . wait for it . . . mile. Moral of the story: It’s totally possible to make it to Mavis Lake from Round Lake. But for this winter at least, the Missing Link to Mavis portage is the best bet. 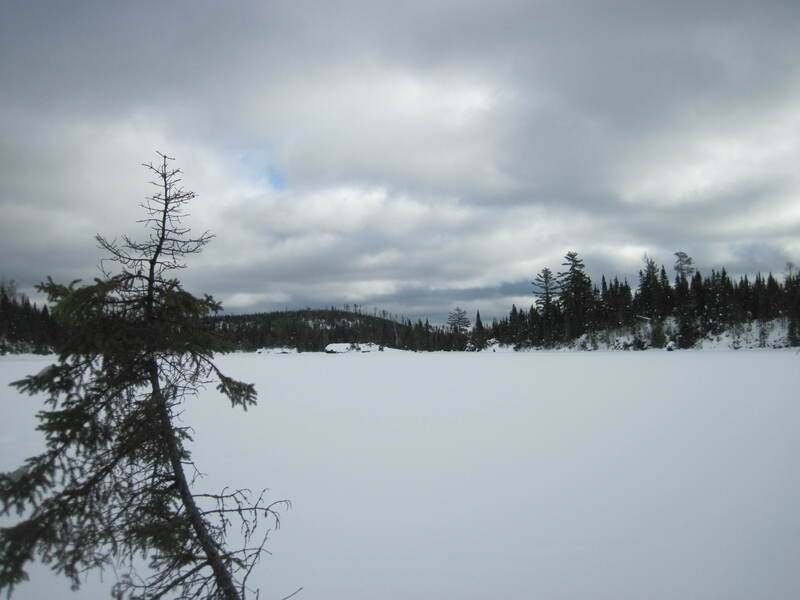 We’ll leave rediscovery of the Round Lake to Mavis portage for a time when there isn’t 30 inches of snow and miles of downed brush in the woods. For the time being, Mavis remains both lost and found. Until next time . . .